In 1958, Emery’s section of Weston Road heading south of Finch was still generally a dirt road. 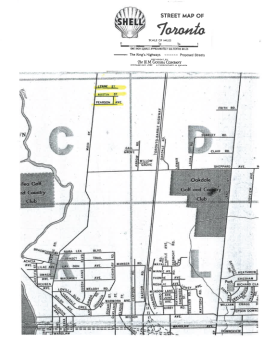 Emery Village’s local residents still officially referred to the roadway as Main Street. However, with Milani’s newly built factories north of Finch and the official opening of Italian Gardens Recreation Facility at Islington and Finch, many new Italian families were being enticed to move to Emery Village away from downtown Toronto - College Street and Little Italy. The building of the new residential homes and subdivisions also sparked the need for the building of primary schools and high schools for Emery’s new families and their young children. St. Jude’s School along Weston Road near Bradstock Road opened in 1960 within a new community known as Woodview Park. The Metropolitan Toronto Separate School Board oversaw the administration of the school with grades ranging from one to eight. Along Weston Road, Riverside United Church and St. Timothy’s Anglican Church operated further south down Weston however there was no functioning Catholic Church for these new residents of Emery Village. 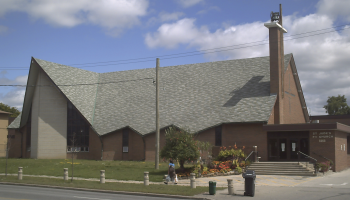 St. Jude’s Roman Catholic Church opened in 1962 with voluntary assistance from many founding patrons which included Joseph Bannon of Humberlea. Around this time in the late 1950s, there existed three parallel streets on the east side of Weston Road. The streets were Lynne Street (later re-named Imogene Avenue) Austin Street (later re-named Damask Avenue) and Pearson Avenue (modified and re-named as Calm Court). The land the new school and church were to be built upon had Pearson Avenue that travelled east to where 97 and 100 Rivalda Road exist today. For the planning and building of the church, Pearson Avenue was to be closed and modified and a new street called Calm Court was constructed and this opened up the needed land for the new school, playground and church. Nearby, Woodview Park Plaza was built and opened on the east side of Weston Road at Bradstock and had a large IGA grocery store. Back in the day, groceries at the store were carried out to trunks of automobiles by way of an elaborate conveyer-belt system. IGA even had home-delivery service for those wanting their groceries brought directly to their houses. How state-of-the-art and consumer friendly Emery Village’s businesses really were in the early to mid 1960s. These days, St. Jude’s Church is in the last year of a 5 year capital campaign in order to raise much needed funds for urgent and necessary repairs, like removal of asbestos, replacement of the furnace and other essential continuation. Teresa Tedesco has been leading the campaign as chair since 2009. St. Jude’s will be holding its annual Gala Friday, November 14, 2014 at the Paramount Conference and Events Centre in Woodbridge. The Gala is the most significant fundraiser. More information regarding the Gala will be announced in October’s issue of the Emery Village Voice. Should you wish to contribute to the ongoing maintenance and fundraising efforts of the Church, please contact Teresa Tedesco or Rev. Efrén Alvarez-Palayo at (416) 742-9072.